Part 1 Introduction: Multiple-barrier geological repository design and operation strategies; Spent nuclear fuel recycling practices and impacts; Near-surface, intermediate depth and borehole disposal; Underground research facilities and rock laboratories. Part 2 Geological repository systems: Crystalline systems; Clay systems; Assessing long-term stability; Far-field process analysis and radionuclide transport modelling. Part 3 Engineered barrier systems: Immobilisation of spent nuclear fuel and radioactive waste; Low-pH concretes; Smectitic buffer and backfill; Near-field processes, evolution and assessment; Nuclear waste canisters, corrosion and long-term performance; Post-containment performance. Part 4 Performance assessment: Safety assessment for deep geological disposal; Safety assessment for near-surface disposal; Treatment of uncertainty in the performance assessment; Assessment of expert judgments; Knowledge management systems. Part 5 Radiation protection, regulation and social engagement: Radiation protection principles and standards; Risk-informed, performance-based regulations; Environmental monitoring programs and public engagement; Methods for social dialogue. Geological disposal has been internationally adopted as the most effective approach to assure the long-term, safe disposition of the used nuclear fuels and radioactive waste materials produced from nuclear power generation, nuclear weapons programs, medical, treatments, and industrial applications. Geological repository systems take advantage of natural geological barriers augmented with engineered barrier systems to isolate these radioactive materials from the environment and from future populations. Geological repository systems for safe disposal of spent nuclear fuels and radioactive waste critically reviews the state-of-the-art technologies, scientific methods, regulatory developments, and social engagement approaches directly related to the implementation of geological repository systems. Part one introduces geological disposal, including multiple-barrier geological repositories, as well as reviewing the impact of nuclear fuel recycling practices and underground research laboratory activities on the development of disposal concepts. Part two reviews geological repository siting in different host rocks, including long-term stability analysis and radionuclide transport modelling. Reviews of the range of engineered barrier systems, including waste immobilisation technologies, container materials, low pH concretes, clay-based buffer and backfill materials, and barrier performance are presented in Part three. Part four examines total system performance assessment and safety analyses for deep geological and near-surface disposal, with coverage of uncertainty analysis, use of expert judgement for decision making, and development and use of knowledge management systems. Finally, Part five covers regulatory and social approaches for the establishment of geological disposal programs, from the development of radiation standards and risk-informed, performance-based regulations, to environmental monitoring and social engagement in the siting and operation of repositories. 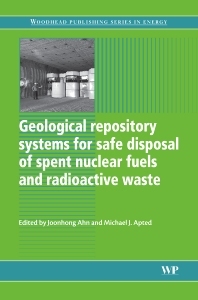 With its distinguished international team of contributors, Geological repository systems for safe disposal of spent nuclear fuels and radioactive waste is a standard reference for all nuclear waste management and geological repository professionals and researchers. Dr. Apted has more than 25 years of experience in nuclear-waste disposal R&D, primarily in the design and testing of engineered barrier systems (EBS), hydrogeochemical modeling, and safety assessment. For the Electric Power Research Institute he is the R&D manager for post-closure risk assessment studies regarding disposal of spent nuclear fuel and high-level waste at the Yucca Mountain site, Nevada, USA. He is a member of the International Technical Advisory Committee (ITAC) to the Nuclear Waste Management Organization of Japan (NUMO), and serves as a coordinator for NUMO's International Tectonics Committee. Dr. Apted is Chairman of the EBS and Technology Support Group for STUK, the safety authority in Finland. He also has consulted for nuclear waste repository implementation and regulatory agencies in Sweden, Switzerland, South Africa, Canada, Taiwan, and South Korea. Professor Joonhong Ahn is a Professor of Nuclear Engineering at the University of California, Berkeley. He also serves as Geological Faculty Scientist at Lawrence Berkeley National Laboratory. Since 2010, he serves as a member of the international review committee for 2010 report compiled by Nuclear Waste Management Organization of Japan (NUMO) Fellowship Program by Office of Civilian Radioactive Waste Management, US Department of Energy. He has been participating in the Coordinate Research Project by International Atomic Energy Agency for the topic of Role of Partitioning and Transmutation of High-Level Radioactive Wastes for Minimization of Environmental Impacts from Nuclear Fuel Cycle since 2002.